Maud Green told her memories of school life in Dayton in the 1870s and 1880s. 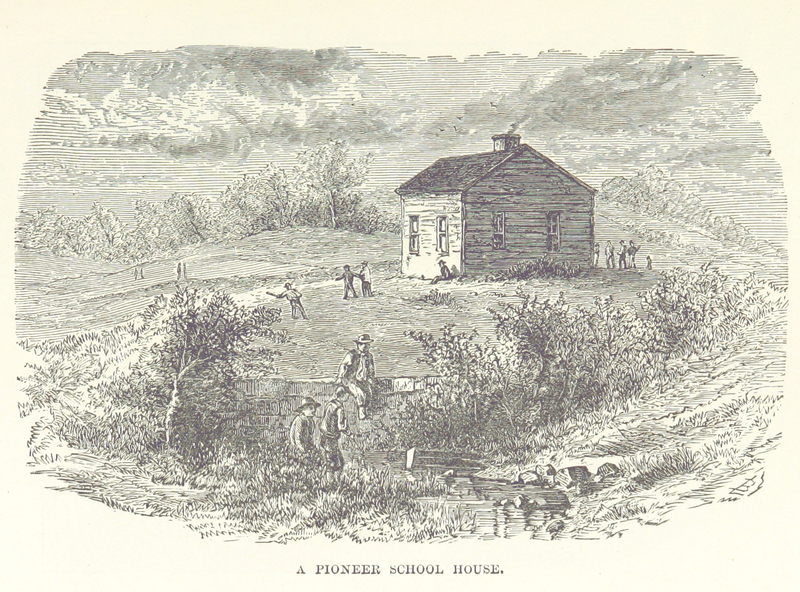 The school would not have been as isolated as the one shown above, as it was right in the heart of the village. The desk tops were hinged and when the boys walked on them mischievously they sometimes dropped unexpectedly with disastrous results. A bench ran around three sides of the room to accomodate more pupils. The other furniture consisted of the teacher’s desk and a small organ. There was always something extra for Friday afternoon. One teacher read us chapters of “The Swiss Family Robinson” each week and we spoke pieces and sometimes had a treat. Once it was oyster soup! We all had slates instead of tablets and our slate pencils came covered with gold or silver paper. Once we girls put boards over the corner of the fence to make a play-house at school & we all took rag-dolls to play with at recess. Our best “play house” at home was when the oats-bin was empty in what we called the “little barn” north of the house. Of course we all wore sun bonnets.